Reddit user Gluetendo has stumbled upon an interesting glitch in Smash Bros. Wii U. 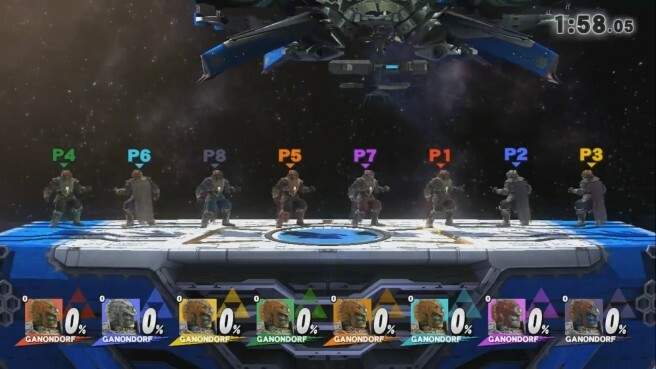 By taking advantage of it, it’s possible to control eight characters at once. Use a controller that can “desync” (a GameCube controller preferably). Go to the 8-Player Smash mode. Just move your joystick until the “Player #” or port space pops up. Click the name part of your port until it says “None”. Remove your controller from the port or desync it. Move your joystick again and now you will be the Player in the next available space after your scanned amiibo. Nothing out of the ordinary, but trust me, it’s working. Repeat Steps 5-9 until all the Player spaces are filled with the 8 amiibo. Go to the Settings (where Time or Stock and Item rules are). Then simply exit. If you’d like to see the glitch working, give the video below a look.